One would need a secret agent decoder ring to untangle the web of lies Scam Sethi has spun across the blogosphere this week. I suppose the most pervasive lie he continues to perpetrate is Blognation’s funding status and what he told his editors. According to his update on Blognation, Sethi falsely claims the following. I explained we were in the process of raising funding and that we were already in discussions with several Angel and VC’s as far back as July. Each editor was aware they would be paid in full, back dated from when they joined upon closure of the funding. I also said I expected to have closed it at the end September if not sooner. Also compare his statements this week with those in his own words to a prospective Blognation editor. So what we’re offering everybody is a base salary, a percentage of the ad revenue based on how much traffic…. So the way the ad revenue works, the more people generate page impressions the more ad revenue we generate and you get a percentage of that revenue. Pretty simple model really. And then we offer stock options. And we do that for everybody. And that just makes life useful. Because as we said, there’s no point – bloggers make no money and if they make no money their not interested. Sam compounds his twisted accounts of Blognation’s funding status by assuring Jemima Kiss of The Guardian that funding is imminent. He gave me the name of the investor and said money is due to come through on December 10th. “Anyone raising money knows that it takes time, and it can be a horrible business. It has taken four months to grow this idea to a brand. Every editor has a contract and has the right to sue me, but there are nine editors on the backchannel that are aware of what is happening with the funding. Let me state the obvious and point out that today is December 11th and there’s been no word from Sethi on the checks he’s written or electronic transfers completed to his beleaguered editors. Sethi does get one part of his quote to Jemima correct. All of those who joined Blognation have contracts and have the right to sue him. This story just gets crazier and crazier. Scam Sethi has taken number of steps this weekend which defy rationale. Sethi has admitted that the Secora term sheet sent to TechCrunch came from his gmail account. Sethi has admitted that he impersonated one of his blog editors to leave a comment on TechCrunch. Sethi has locked out a top performing Blognation editor only because they communicated with Oliver Starr and me. Blognation under Sethi’s leadership is moving from being a great idea and a strong competitor to the top blog companies like TechCrunch and Read/Write Web to becoming a through-the-looking-glass experience. Tomorrow we’ll learn whether Blognation’s editors will finally be paid or whether there’s a new dimension to Sethi’s imagination. Finally in his own words, from a voice recording made on June 6, 2007 Sam is clearly heard to say, “Now, I’ve already raised 1 mil pounds and I’m already budgeted for 22 full-time editors.” So, if this is true then why is no one paid? If this is not true, then why did he say it to the editors he wished to recruit? Sam has claimed in his comments following the resignations of Oliver Starr and myself that Blognation editors were aware of Blognation’s funding. We were not when joining as he made declarations similar to the one recorded here to each of us which is a central complaint as expressed in Oliver’s letter. As is documented in the previous post here, I did not join Blognation until October 21, 2007 and was told by Sam on joining that Blognation was funded. Sam left this statement in comment on Shel Israel’s blog. A number of facts need to be corrected in your post. Much of what you wrote is blogsphere fiction and gossip. 1.I resigned – Mike never fired me on matter of principal. 2.I never stole any money and Arrington knows that as he claimed it from the sponsors. In fact Mike never paid me and still owes me expenses. 3. All the editors knew coming in that the project was seeking funding and would only be paid once we got the funding. I can not speak to the facts associated with numbers 1 & 2 in Sam’s comment, but I can state unequivocally that #3 is a lie. Sam stated Blognation had funding to cover operations for one year when I agreed to join. From the current investor’s point of view, if Sam did raise 1 mil GBP, they would likely want to know how that money was used. If Sam didn’t raise the money, then why did he say that he did? Many people would like to know. What say you now Sam? Update: You can download the mp3 ScamtoneTM for your mobile – click here. More ScamtonesTMwill be released here and via twittergram. Perhaps I’ll do a weekly ScamtoneTM release until the Orchant family is paid. Poor Sam. The amount of documentation that exists on Sam’s deceit is staggering and readers will see and hear some of this evidence published over the coming days. 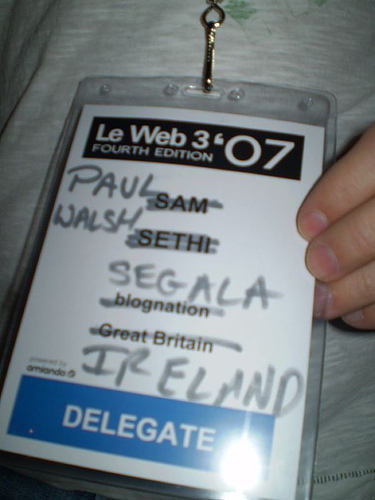 I’ve learned today that a voice recording exists of Sam telling a prospective Blognation editor on June 6, 2007 that he “has already raised 1 mil GBP” to fund Blognation and pay editors 3K GBP/month. Further, “we are budgeted for 22 editors…”. If you wish to report on this story, leave a comment or contact me directly and those who are agreed by the recording owner can listen to portions or all of this 30 minute recording. Be prepared to pay for the international call before making your request. Oliver shared in his letter that multiple promises had been made for payment including the manufacture of supposed bank transfers which never materialized. Below is one such document. I’ve blacked out identifying information on the editor involved to protect their privacy. Keep in mind that Sam offered this screenshot to the editor as proof that a transfer was in route. Why was the proof required? Loss of confidence as a result of many failed promises. When no monies arrived after a week of waiting, Sam claimed it was a mistake. Is he that incompetent or a fraud and liar? Tough choice. Keep in mind that the payment referenced above was not delivered. It’s impossible for reasonable people to comprehend someone going to such lengths as this knowing full well that no payment was made and therefore the lie would be revealed in a matter of days. I still struggle to understand Sam’s irrational behavior. Stayed tuned.